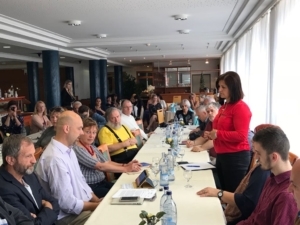 On our third day in Slovakia, together with the colleagues from the Slovak EMIN network, we had the opportunity to meet with Erika Jurinova, the new governor of the Zilina region, with many mayors of the villages and with NGOs and faith-based organisations that work in the social field. The governor stressed that although Slovakia has made progress in many respects, poverty still is a big problem with 700.000 people under the at-risk-of-poverty rate, especially young families with children. Even when the region has no competence to increase benefits, there are many things that can be done. 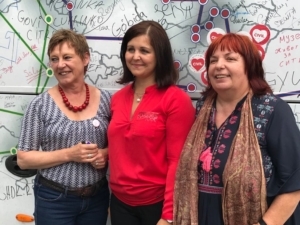 For her the priority lies in working with the civil society organisations that provide services for vulnerable people and investing in prevention. She plans to create a foundation to support people in crisis situation and family centers to prevent people to fall in over-indeptness and expulsion from their homes. Father Gombita who was present as ambassador of the EMIN network in Slovakia, urged for legal measures to guarantee people access to electricity, gas and water, and food support in exchange for work. He thinks European money could be better spent to pay the salaries of social workers. In the discussion several mayor told us about the situation in their villages and what they are doing to fight poverty. The mayor of Vitanova said that a minimum income benefit of 60€ and activation into public work simply do not encourage people to return to the labour market. The benefit should be considerably raised. The representative of an NGO said that no-one can believe that a family with 2 children can live a decent life with 400€ per month. He called upon the EU to raise the bar for Slovakia to ensure that the level of minimum income reaches at least that of other European countries. Several people also insisted that investing in more adequate minimum income schemes can save money that now has to be spend to help people with alcohol and drugs problems. Anna Galovicova from our Slovak network announced their plans to visit the mayors of the villages in the coming months, to collect best practices on a video that will be publised on Facebook. She said that Slovaks are known as humble people, but that now it is time to raise our voices to campaign for improvements in the minimum income system. In the afternoon we moved to Piestany, the seat of the Slovak Anti-Poverty Network, and also a town with the longstanding reputation for its spa-resorts. 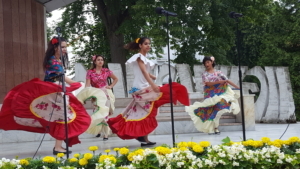 There we enjoyed a Roma cultural programme in the 300 year old park with magnificent trees. The group Khamoro, which means sun in Roma language, danced for all of us a dance of hope for the future.